Aaaaand here's the jacket hemmed, with the facing/lining assembly sewn in as well - basically finished, except for the buttons/buttonholes and a good pressing! Sewing pattern and tutorial coming soon! My 10th Doctor (brown) suit is going really well so far! I finished my replica (GAP) trousers a few days ago. I'm in a bit of a rush to get it done in time for TimeGate next week (I'm doing a panel on 10's suits on Sunday morning at 10:00 - come if you can! ), but I'm still taking the time to get everything just right. Sssoooo much work ... but I'm not going to lie, I'm (mostly) enjoying it! 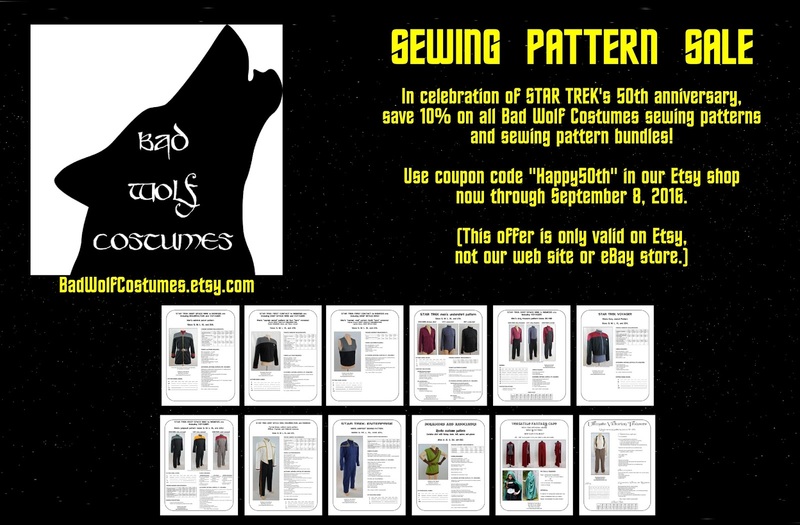 In celebration of Star Trek's 50th anniversary, save 10% on all Bad Wolf Costumes sewing patterns and sewing pattern bundles! Use coupon code "Happy50th" in our Etsy shop now through September 8, 2016. In addition to our numerous costume analysis/tutorial blogs, we've also indexed them by specific costume for you here on our new web site! Simply click the "Tutorials" tab above for a complete list, then click on the one you want to read about. Once you've been taken to that specific costume analysis/tutorial, links to the others will be on your upper left. We just uploaded a handful of new ones, and we have a couple very special ones coming soon!